Cliff Johnson started his career in the 1970s as a catcher in the Astrodome. He was about as suited for that position in that time and place as a grizzly bear at a chess tournament. He appeared briefly in the big leagues in 1972 and 1973, started to play semi-regularly in 1974, and became a platoon player in 1975. 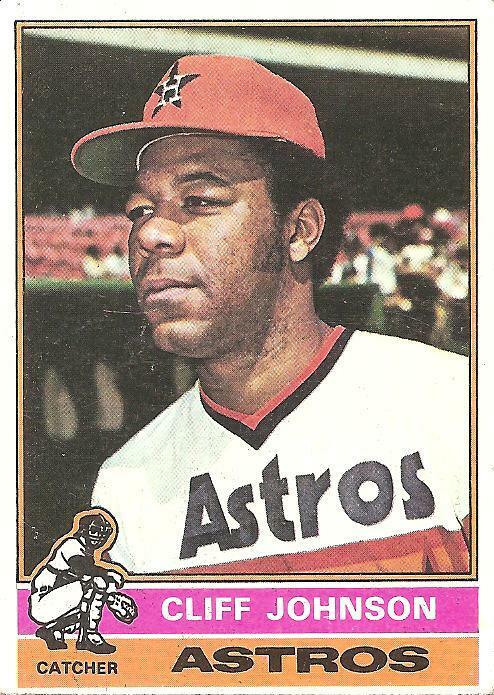 In all, by 1976, the year this card came out, Johnson had smashed 32 homers and driven in 100 runs in 532 at-bats, numbers that amounted to the output of an elite power hitter over the course of a single season. It was understandable that the Astros would want to get that kind of power into the lineup on a regular basis, and so in 1976 Cliff Johnson started 64 games at catcher, his career high. Despite appearing in well under half of the team’s games at catcher, Johnson still nearly managed to win a kind of triple crown of ignominious fielding categories for catchers, finishing fifth in the league in errors committed as a catcher, second in stolen bases allowed, and first in passed balls. He didn’t last much longer in Houston, and in fact his departure midway through 1977 could be seen as the beginning of the team’s rise toward its rainbow apotheosis of the late 1970s and early 1980s, when the collection of fleet, sure-handed, slap-hitting blurs of color became one with the cavernous dome, as effective a pairing of personnel to place as has ever occurred in baseball. Why even try to wrench home runs out of the Astrodome, especially if it means employing the equivalent of a lopsided chest of drawers as your catcher? So Cliff Johnson shambled over to the American League, his natural home, and promptly won two rings as a platoon player with the Yankees in 1977 and 1978. As out of place as he’d been as a catcher on a team that should have been relying on speed and defense, Johnson fit perfectly into the Yankees attack as a part-time provider of right-handed muscle. Those Yankees teams were deep and could come at you in a lot of ways, and Johnson’s arrival in the middle of that first championship year helped shore up a slight weakness, relatively speaking. The team’s best power hitters—Reggie, Nettles, and Chambliss—were all lefties, and two other regulars (left-handed Mickey Rivers and switch-hitter Roy White) also fared better against righties than lefties, so the team tended to struggle occasionally against left-handed pitching. Cliff Johnson gave them no less than a Hall of Fame caliber slugger against lefties: when facing southpaws, his career OPS—slugging percentage plus on-base percentage—was .905, just a shade below the total lifetime marks of Mike Schmidt and Ken Griffey Jr. and better than those of Willie McCovey and Willie Stargell. With that kind of talent, it’s not a surprise in retrospect that Johnson seems to not have embraced his role as a part-timer with complete enthusiasm. Many years later, Goose Gossage would grouse in his autobiography about Johnson being a good deal less than cheery and accommodating when called upon to perform the duties of a bullpen catcher, which is where Johnson was apparently stationed while waiting around for his chance to terrorize opposing left-handed pitchers. The tension between Gossage and Johnson erupted in an infamous 1979 clubhouse brawl between the two lumbering, glowering behemoths in what has to be among the contenders for Brawl in Baseball History I’d Least Like to Try to Break Up. Gossage got injured in the fight, which considering his status as a team superstar spelled the end in New York for Johnson, who was soon shipped to Cleveland. He bounced around for several more years, roaming and pummeling. Some years after his last game in 1986, Bill James wrote in his Historical Abstract that “if somebody had had the sense to make Cliff Johnson a DH/first baseman in a hitter’s park when he was 23 years old, he would have hit 500 homers.” This seems as if it may be verging on hyperbole, given the fact that after those first few years with the Astros, Johnson eventually did become a DH/first baseman, and he still couldn’t ever really crack the lineup on a regular basis. It’s odd that he never did have a full season, playing every day, given his numbers. It’s true that he did fare much better against lefties than righties, but his career righty-lefty splits were no worse than those of Cecil Fielder’s, another immobile slugger who at least had a few seasons as a regular and made the most of them. Cliff Johnson, who will turn 64 on July 22, my wife’s due date, should have had his chance to swing for the fences every day. You are currently browsing the archives for the Cliff Johnson category.